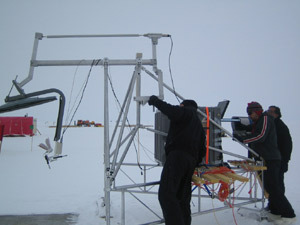 We also helped with the Plane Wave Radar which is a radar that measures the upper layers in the ice sheet. 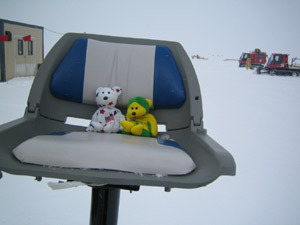 Layers are made as the snow falls and accumulates, then melts just a little bit in the summer. This radar is meant to measure the top 40 meters, where we want to see each layer very clearly. So this radar has a very high resolution (3 cm). The higher the resolution, the clearer the image. We had to keep the radar warm when it was not running, so we used a heater to do this. I was in charge of plugging in the heater at the end of a run. We didn't actually get to run the radar, but we are sitting where the radar operator sits on a run. The operator turns on the radar and then watches the screen to be sure that the radar and the GPS (Global Positioning System) are running correctly and that the data is being saved. The GPS tells us exactly where on the ice sheet each piece of radar data was taken. The GPS uses satellites to determine latitude, longitude and altitude. Some of you may have a GPS system in your car. We thought the GPS was very interesting so we read these tutorials to understand it better. 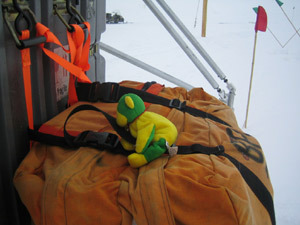 When you go out on the ice sheet, you always take an emergency bag. It includes a radio, tent and food in case your group gets stranded and can't get back to camp right away. 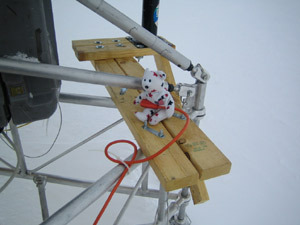 OzGold makes sure that the emergency bag is tightly strapped to the plane wave radar sled. Before the plane wave radar goes out, it has to be calibrated. This means that we test the radar against some reference materials to be sure that it sends back signals correctly. We know exactly how strong a signal should be sent from different reference materials, so we look to see if we get that signal. If not, we adjust the radar until we do. This takes quite a bit of time to do correctly, but is very important. Drs. Braaten and Gogineni along with Joel Plummer are making some small adjustments to the radar antenna, then checking to see if these adjustments make the radar as accurate as it should be.